True to size, somewhat narrow at the fron, but this will be wider after wearing. Due to the platform the heel seems to be higher then it is, the real height of the heels are: platform - heel! New collection! Lola Ramona - Shoes With An Attitude! 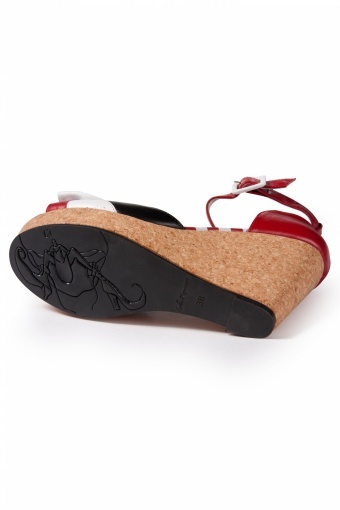 40s Ketty Red White Black Cork Wedge Heel. Wedgeheels are real classic must haves and beloved since the first introduction in 1937. That is not surprising because a wedgeheel gives you the perfect combination of elegancy & comfort. Even if you cannot walk on heels, with wedgeheels it is a piece of cake! This gorgous shoe is made of edgy contrasting lipstick red/white and black leather. 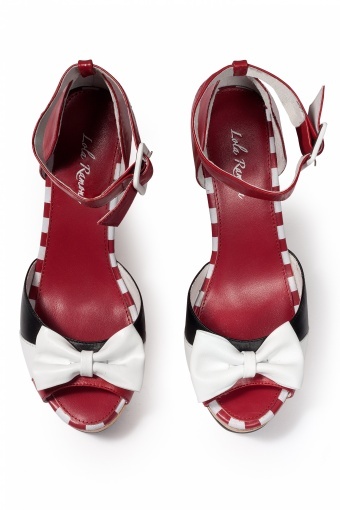 The sassy design wouldn't be complete without the striped lining and the cute bow. As many current wedgeheels are too blunt or to 'beach style', this shoe can easily be worn under a beautiful dress or with trousers, as they are made from leather, inside out. 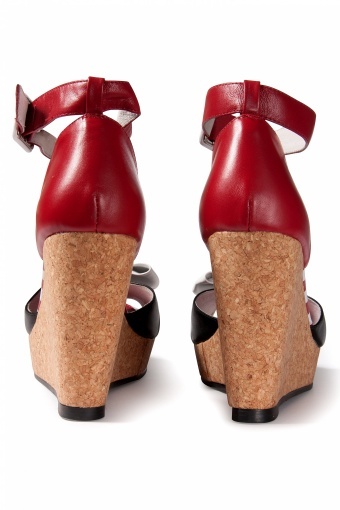 The heel is made of cork and this makes them suprisingly light as a feather! Comfy padded footbed. Rubber anti-slip sole.